For other uses, see Lou Graham (disambiguation). 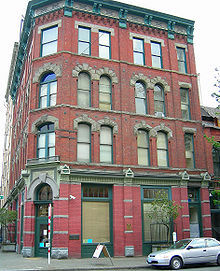 The Washington Court Building in Seattle, former site of one of Lou Graham's brothel. Lou Graham (February 9, 1857 – March 11, 1903), born Dorothea Georgine Emile Ohben, was a German-born woman who became famous as the madame of a brothel in what is now the Pioneer Square district of Seattle, Washington, USA. She was referred to as the "Queen of the lava beds," with 'lava beds' referring to the area of tide flats that were filled in with sawdust from the sawmill. She became one of the city's wealthiest citizens before dying in her forties. Graham arrived in Seattle in 1888; the city, barely three decades old, was at the tail end of a period (from November 23, 1883 until a series of court decisions in 1887–1888) in which women's suffrage had led to a triumph of "reform" politics there. Monied interests were voted out of political office, liquor licenses revoked, brothels closed and relevant laws strictly enforced. The result for this frontier economy was, in the words of local popular historian Bill Speidel, that "The fines and licenses on liquor, gambling and prostitution that had been the major source of income for the operation of the city dwindled to almost nothing." Graham approached Jacob Furth, and through him a number of the city's leading businessmen, with a proposal for the establishment of a brothel comparable in prices and quality to the city's finest hotels. Prices were to be openly posted (as against charging what the traffic would bear from night to night), staffed by women who would be (Speidel's words again here) "gorgeous…, talented…, … [and] who could discuss the opera, or politics, or economics, or world conditions on an intelligent level with the leaders of America. With their forthcoming start-up capital she purchased the property at the corner of Third and Washington. Her first building was short-lived; it burned in the Great Seattle Fire of June 6, 1889, but she had already profited sufficiently to rebuild in stone afterwards. In less than 18 months she had done well enough to expand significantly. Her initial parcel of land had cost $3,000; The larger parcel she bought after the fire cost $25,000. She established the young city's most refined parlor house at the southwest corner of 3rd Avenue South and South Washington Street, "a discreet establishment for the silk-top-hat-and-frock-coat set to indulge in good drink, lively political discussions and, upstairs, ribald pleasures -- all free to government representatives." Speidel, in his history of early Seattle Sons of the Profits, remarks that in her heyday "More city business was transacted at Lou's than at City Hall." The building survives as the Washington Court Building, 221 South Washington Street and houses, among other things, part of the Union Gospel Mission. There are interior vestiges of the original brothel in the form of a stairway leading up to a second-floor landing from which former bedroom spaces are accessible. During the period of Graham's ascendancy, Seattle wavered back and forth between "open city" and "closed city" policies. Graham's establishment briefly went dormant during one such "closed city" period in 1890 but soon opened wide its doors for business once again. By February 14, 1891 (Valentine's Day, ironically), something of a "Wild West" atmosphere had returned to the tideflats, and a rookie policeman involved in a general crackdown on prostitution arrested Graham out of ignorance of her identity. The result was acquittal in a jury trial and (according to Speidel) the subsequent resignation of reform mayor Henry White. For the rest of Lou Graham's life her brothel remained an institution. "No young businessman was really considered a man about town until he could discuss with ease the interior decorations of Lou's establishment...and some of the finer points of the distinguished young ladies…"
…about five feet, two inches...and at chest height, she was about three feet thick. She went for plumed hats and smart carriages… Lou stood for integrity in her field...and a kind of class that couldn't be matched outside of the other major cities of the world like San Francisco, New York, London, Paris. She was a first-rate businesswoman…[who] invested heavily and profitably in the stock market. The fortunes of many of Seattle's leading families were founded on loans from Graham. When banker Jacob Furth was approached with a loan request for a business idea that he thought was good, but which he did not think his board of directors at Puget Sound National Bank would approve, he would send them on to Graham, who would make a loan at higher interest, but with less formality. Graham may have been instrumental in saving Furth's bank from a bank run during the Panic of 1893 by ostentatiously making a large deposit. After she died a Puget Sound National Bank employee became administrator of her estate. By the time she succumbed to syphilis in San Francisco in 1903, Graham had become a wealthy landowner, one of the largest in the Pacific Northwest. She owned one of Seattle's great mansions (2106 E. Madison Street, demolished in 1966) and "contributed liberally" to projects sponsored by the Seattle Chamber of Commerce. She contributed more money to the education of the city's children than the rest of the city's prominent early citizens combined. After the Panic of 1893, her loans saved some of the city's most prestigious families from bankruptcy. At least one source says she left her estate to relatives in Germany, but according to Bill Speidel she died intestate, and her supposed relatives from Hamburg turned out to be frauds. Her estate went to support the common schools in King County, the county in which Seattle is located. Speidel wrote in his last book that traditional forms of documentation consistently underrate the contribution of women in general, and particularly of less respectable women such as Graham. He credits Henry Broderick and Joshua Green with corroborating Graham's importance and her business relationship with Jacob Furth, but he notes that both insisted that their names could not be cited in this connection until after their deaths. ^ Bill Speidel, Through the Eye of the Needle, Seattle: Nettle Creek, ISBN 0-914890-04-2. p. 49. Sources agree on her death date, but some give different birth dates; for example, Priscilla Long's HistoryLink article says 1861 and gives her age at death as 42. M.L. Lyke, in a work of historical fiction, says 43. ^ a b c d e f Priscilla Long, Madame Lou Graham arrives in Seattle in February 1888, HistoryLink, January 1, 2000. Accessed 6 July 2006. ^ a b M.L. Lyke, The Misadventures of Skukum Kilay, Chapter Three: The Grand Madame, Seattle Post-Intelligencer, November 3, 2001. This is a work of fiction, but "The grand madame, Lou Graham, is real, but her journal is a fabrication." Accessed 6 July 2006. ^ Keniston-Longrie, Joy (Jul 1, 2009). Seattle's Pioneer Square. Arcadia Publishing. ISBN 978-0-7385-7144-7. Accessed 31 March 2017. ^ Speidel (1967), p. 285, 288. ^ Speidel (1967), p. 285-287. ^ Speidel (1989), p. 51–52. ^ Speidel (1967), p. 288-291. ^ Speidel (1967), p. 292-293. ^ Speidel (1967), p. 294. ^ a b J. Kingston Pierce, Seattle's Pioneer Square (page 2), Primedia Publications. Accessed 6 July 2006. ^ Speidel (1967), p. 295. ^ Speidel (1967), p. 294-295. ^ Speidel (1967), p. 300-304. ^ Speidel (1967), p. 299. ^ a b Speidel (1967), p. 283-284. ^ Speidel (1989), p. 49–52, 62–64, 59. ^ Speidel (1967), p. 298. ^ Speidel (1989), p. 59. ^ a b Speidel (1989), p. 60. ^ Speidel (1989), p. 61, 133–134. Speidel, Bill (1967). "The Hostess With the Mostest". Sons of the Profits. Seattle: Nettle Creek. pp. 283–304. ISBN 0-914890-00-X. An entire chapter "The Hostess With the Mostest", (p. 283-304) is dedicated to Graham. This page was last edited on 26 January 2019, at 20:46 (UTC).